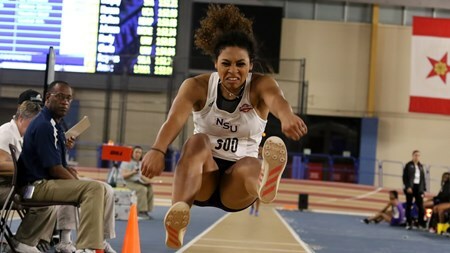 Northwestern State jumper Jasmyn Steels moved into the NCAA’s indoor track and field women’s long jump top 10 with her winning leap of 20-7 ¼ at the LSU Bayou Bengal Invite last Friday, while standout sprinter Micah Larkins retained his top 30 standing in the men’s 60 meter dash. Steels and Larkins are expected to compete this weekend as NSU takes part in the UA Tyson Invitational at Fayetteville, Arkansas, on Friday and Saturday. Steels’ jump is the ninth best in the country for NCAA Division I and sets a new personal indoor record beating her old mark of 20-4 ½ that she posted at the OU Sooner Challenge on Jan. 19. It also ties her for first in the Southland Conference this season. Her overall best in the event is 20-7 ¾, good for second all-time in Lady Demons history behind four-time All-American Stephanie Sowell, who jumped 20-10 ½ in 2003. Jumps coach Tyron Stewart isn’t surprised by Steels’ performances this season considering her success a year ago. “Jasmyn is really on a roll. She picked up right where she left off last season and really understands what she needs to do,” said Stewart about the junior from College Station, Texas. Larkins remains in the national spotlight in the 60 meter dash despite sitting out the LSU Bayou Bengal Invitational. His 6.69 time two weeks ago at Pittsburg State places him in a six-way tie for 28th in the country and ranks third in the conference. Associate head coach and sprints coach Adam Pennington said the senior from Haughton has been working through an injury, making his national standing even more remarkable. NSU is tracking toward the Southland Conference Indoor Championships Feb. 24-25 in Birmingham, Ala.